This post is sponsored by Hobby Lobby. All opinions, as usual, are my own. Did you hear that really loud squeal this past weekend? 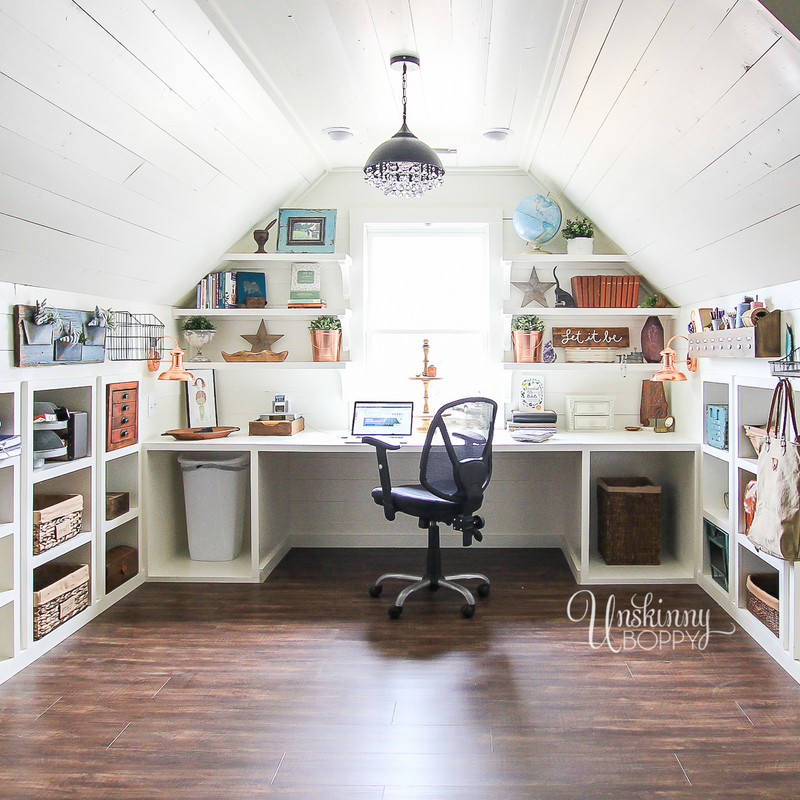 That was the sound of me “SQUEEEEEing” as I started decorating my new attic-turned-office space! That’s right–this room is VERY close to the finish line, and I am turning some imaginary cartwheels with glee to finally have the room of my dreams finished. Can you see why I’m squealing? We are not 100% finished yet- still waiting on cabinet doors to arrive- but it’s like 99.99999% finished and I am moving in, baby! Right smack in the middle of finalizing the details of my new office, Hobby Lobby contacted me to see if I wanted to join them for a “Get Organized for Under $100” challenge. And I was all “Are you kidding me? Bring it on, HobLob!” I need as much organization help as I can get. 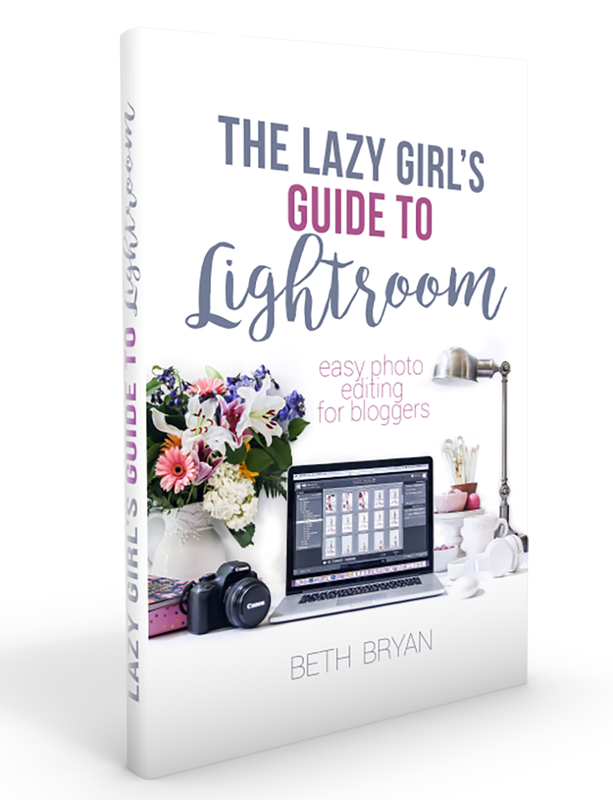 Creative folks like me aren’t exactly known for our clutter-wrangling skills, but I’m up for the challenge. 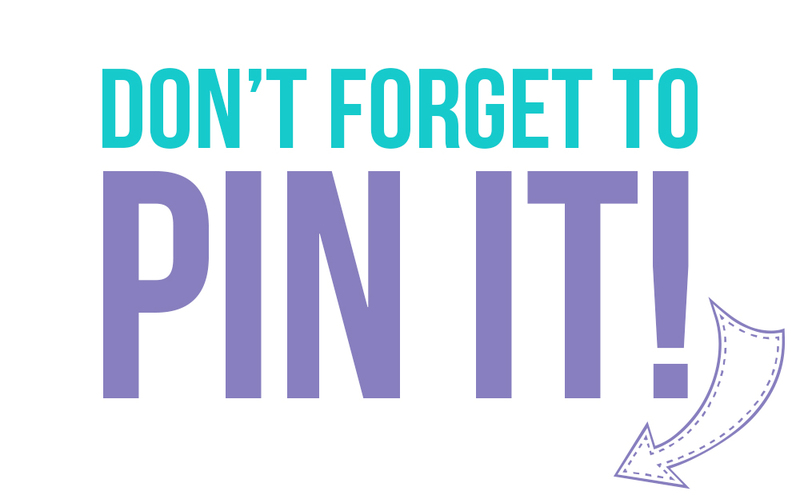 …and SCISSORS! Good greifous, Bocephus! Who knew I owned fifty pairs of scissors? I sure didn’t. Now that I’m good-n-organized I know exactly how many pair of scissors I own and exactly where to find them. No more digging through junk drawers in exasperation and running out to buy a new pair every 90 days. 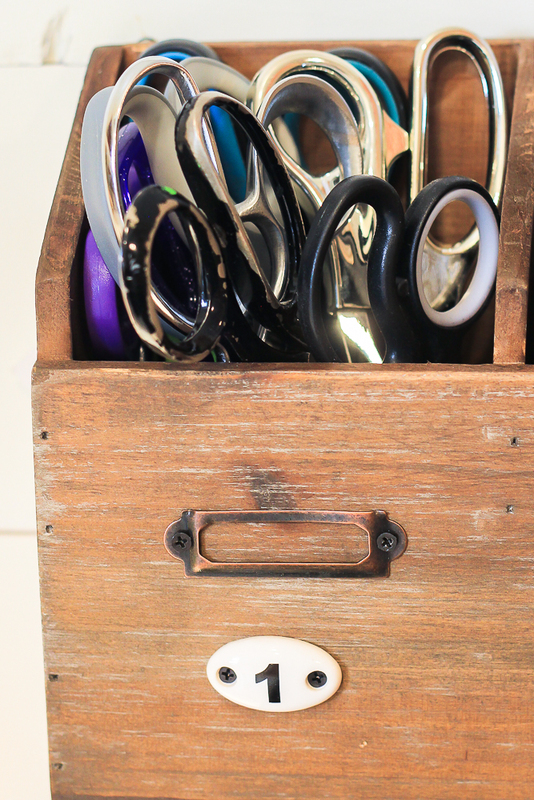 This scissor stash alone could have paid for the organizer. Look at all the money I will save in the future! OK, so once that was in my cart, I saw the grey metal buckets over in the Spring shop and tossed a few of those in as well. You can see them peeking out of the center compartments holding my new hand-lettering markers and watercolor pencils. At first I was running through the store tossing things in my buggy like a contestant on Grocery Games, but then I realized I only had $100 to spend so I needed to be smart with my purchases. But for the record, I could have spent waaaaaaaaay more than $100 to get all these cubbies in this room organized. Hobby Lobby’s farmhouse decor game is strong right now so if you are a fan of Fixer Upper style then you need to run like the wind and check out the selection before it’s all gone. My next two big purchases were these really cool teal metal bins to hold all my art and scrapbooking supplies. The top one has a locker feel and the bottom one has a chalkboard front so I can remember what is stored down there. 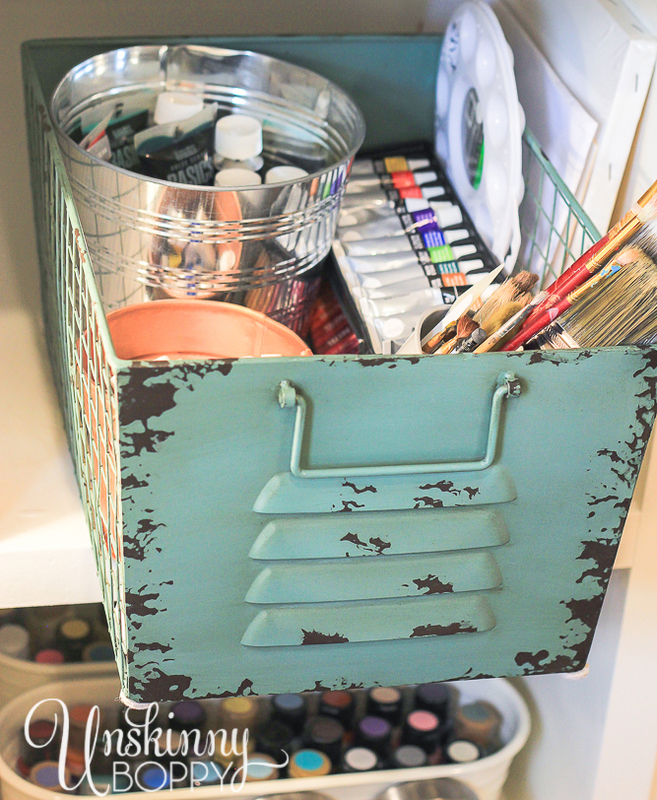 I already had the metal buckets full of craft paint as well as the other baskets above and below my camera bag. I can now instantly put my hands on all my watercolor supplies when the creative urge strikes. Garrett has started taking art classes after school, so he will have fun digging through all of my acrylics and oil paints. I’ve got more tubes of paint than a Bob Ross episode, but now that it’s all organized I can actually find everything and use it again! Woohoo! Not gonna lie, the big bins combined with the wooden organizer ate up a pretty big chunk of my $100 budget, even though one of them was on sale and I got the other using my 40% off coupon on my trusty Hobby Lobby iphone app. I always have the app open when I checkout, but if you’re still a paper coupon girl here is one you can use! 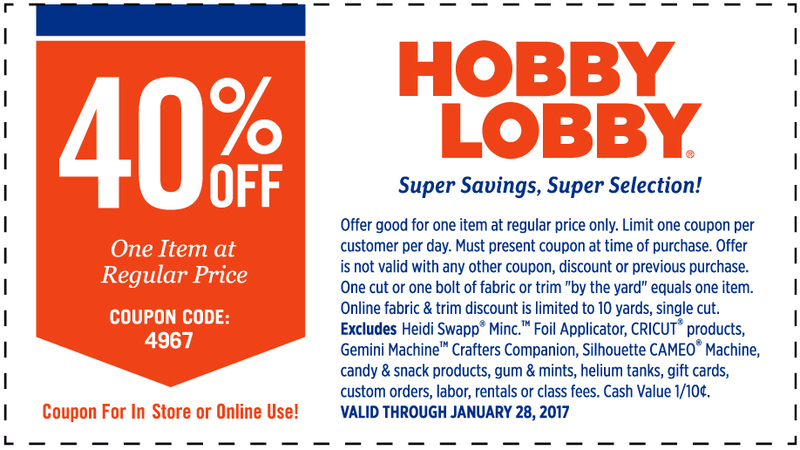 Just show this to the cashier and take 40% off any regular priced item. 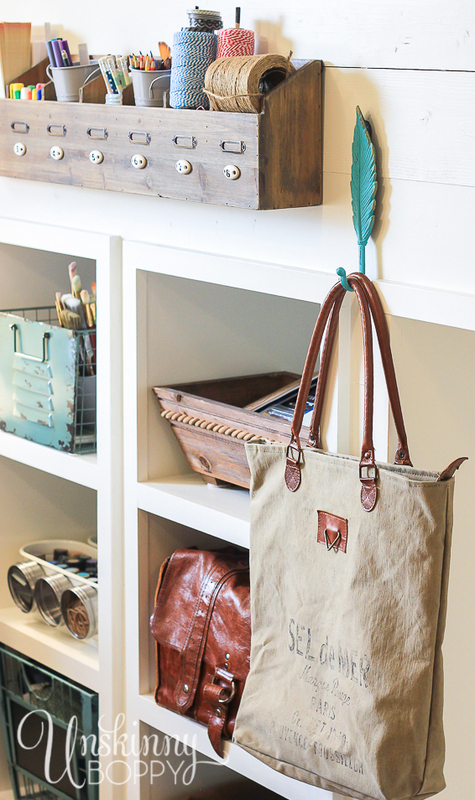 I couldn’t resist two of these blue metal feathers to hang my laptop bag, which brought my grand total right up to the edge of $100. I’m so sick of kicking my camera and laptop bags on the floor so I’m happy to have them both off the ground now. Oh man. I came in at .85 cents over budget! And let’s hope they didn’t want me to include tax because then I’m really in trouble! 😉 But, you have to admit that is a LOT of amazing stuff to help me get my crafts organized again. All of my craft room has been packed up since we moved into this house so it was like Christmas getting to open all those boxes and finding my fun stuff inside! Now that I’ve gotten this corner finished it’s time to keep working on the rest of the space. I need about forty-leven more of those metal bins to hold all the toys over on the playroom side of the room. I am in need of more baskets and bins than I can shake a stick at, but I know exactly where to go now for some really cute ones! See you soon, Hobby Lobby. I have SO much more to show y’all in this room, so stay tuned for the GREAT BIG FULL room reveal very soon! This is a sponsored conversation written by me on behalf of Hobby Lobby. The opinions and text are all mine. Comments submitted may be displayed on other websites owned by the sponsoring brand. This room is #goals. I am floored by its beauty. 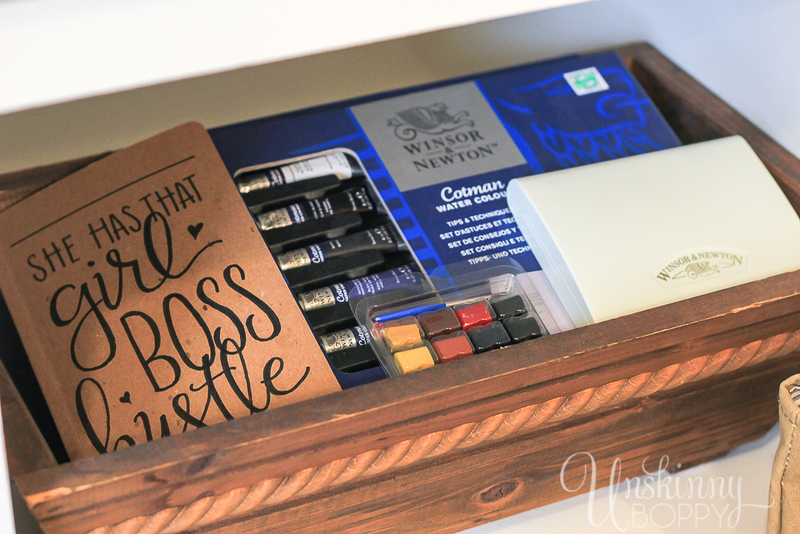 How wonderful to have such an awesome office space and I love that wooden divided organizer from Hob Lob! Thanks Jane! As soon as I saw that wooden divider I knew it was mean to go in that room- perfection with the narrow walls above the cubbies! what a cool space! I love the way you’ve put it together. Gorgeous job Beth! I love your space and would love to have it! My fave is that copper light fixture! Beautiful!!! Love your new space! Hobby Lobby is opening in my town in a couple months and I am beyond excited. I fell in love with them when we lived for a short time in Oklahoma. Your craft space is amazing Beth! I love to see how people use that awkward attic space for something wonderful. Lucky, lucky you having this wonderful space. It is truly an organizational dream. My daughter and I are in love with Hobby Lobby too. It is so great for everything to have a home. That not only helps to find things, but it makes it so much easier to straighten up. I can’t wait to see the rest. I love the way you write too. I can hear your excitement. 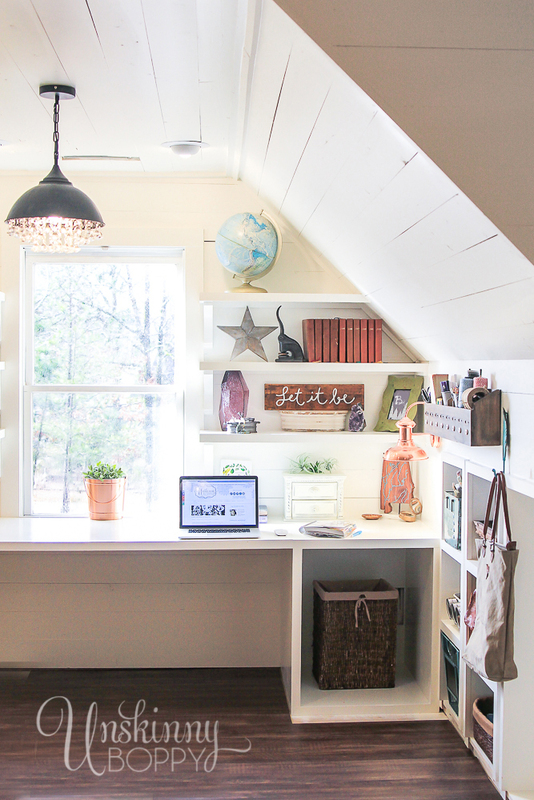 Gurllllllll- You know I had major craft room envy at your old house and this one is even better. I LOVE the way you finished it out. You are the design and organizing queen. Awesome!!! 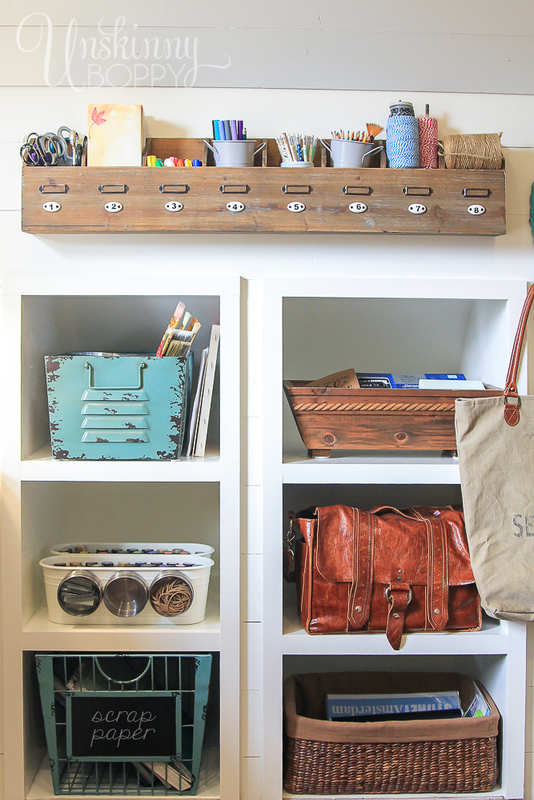 I like what you did in your craft room! The room went from just there to absolutely breathing vitality and glowing with energy. What a great place to work! WOW, WOW and WOWSER!! You are one lucky girl…I love everything about your space you created. It’s Beautiful!! Wow Beth, I love the transformation! What a spectacular space! Who wouldn’t want to have it! Great job, you’ve definitely inspired me! Absolutely LOVED this room! Gave me some great ideas! Can’t wait for the rest of the reveal! 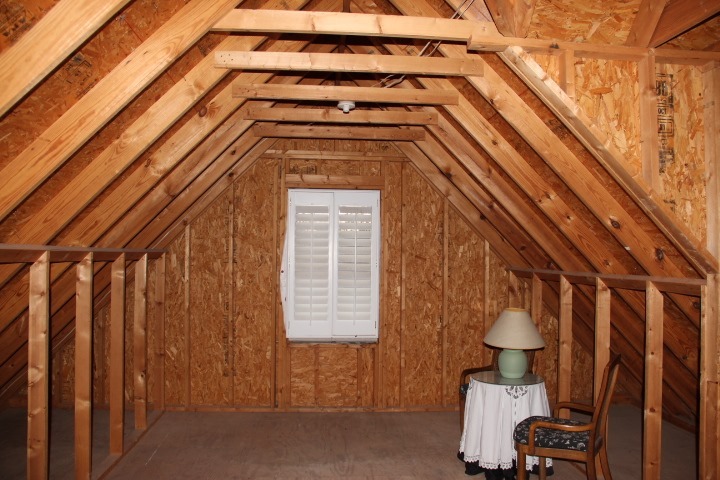 Your attic renovation looks wonderful! Creating livable, workable space out of a previously unused space in your house is like finding hidden treasure. It looks so light, bright, and clean now. I love your choices for organization elements from Hobby Lobby. Everything came together so nicely! *Drool* This room is beautiful!!! 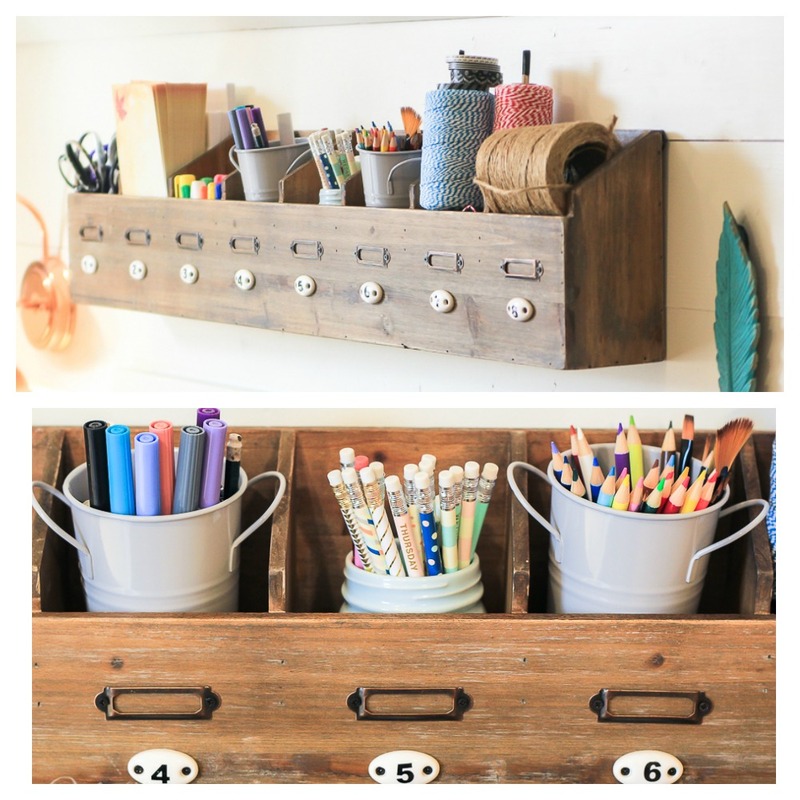 I’m going to try making one of those wooden organizers – the kids pencils etc are overflowing right now. Thanks for the gorgeous inspiration ? Do you know if the wall organizer is still available? I cant get the link to work. Love what you’ve done with your office/art room! 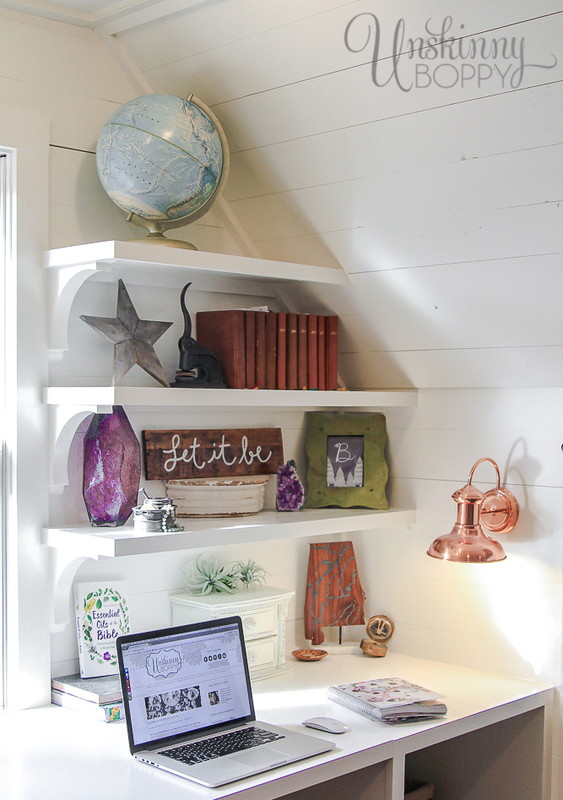 What I REALLY love is the copper wall lamp to the right of your desk- STUNNING!